Tonight I thought I would write about a two week trip my husband and I took last September to California, including some time in Napa and Sonoma. Now, while I enjoy a nice glass of wine, and may be a foodie, prior to this trip, I was by no means a connoisseur of fine wine. However, the combination of the sustainably grown, organic local foods (from cheese to figs), the locally produced, family-owned boutique wineries, and the beauty of the natural surroundings completely sucked me in. I spent months planning exactly what wineries and restaurants we would visit on our trip, and was not disappointed. In this article, I will review some of the wineries and restaurants we did visit, and why I believe a trip to Napa and Sonoma is essential for anyone who enjoys good fresh food, natural beauty, sustainable agriculture, and of course, wine. Certain varieties of wine are common to different parts of the Napa and Sonoma Valleys. Without getting into extensive detail of what is grown where, I note that the following wine varieties are commonly produced in various parts of the Napa and Sonoma Valleys: Chardonnay, Pinot Noir (though probably inferior to the Pinot produced in the Willamette Valley in Oregon), Cabernet Sauvignon, Syrah, Petite Syrah, Zinfandel and Sauvignon Blanc. These varieties account for the majority of the wines we tasted on our trip. First, I will touch on the food. We ate at the following restaurants of Note: Cyrus, Ubunto, Auberge du Soleil and Girl and the Fig. We did not eat at the most expensive and best known restaurant in the region, French Laundry, but we loved the places we did go to. (From what I heard, the food and the garden at French Laundry are amazing if you can get a reservation and have $800 to spend on dinner for two). We had the seven course tasting menu at Cyrus, where the food was absolutely incredible, along with a glass of Pinot Noir from Copain Winery, in Healdsburg, which we toured the next day. The food was fresh, ornate and delious. The people at Copain were really nice - they arranged for a last minute private tour after I told them how much I had enjoyed their Pinot Noir at dinner at Cyrus the previous night. We enjoyed seeing the winemaking facilities at Copain and tasting a number of the excellent red wines, including Pinot Noir and Syrah. We also enjoyed Ubuntu, an entirely organic vegetarian restaurant in Napa Valley that was able to create masterpieces with fruit and vegetables that I never thought were imaginable. All of the produce at Ubuntu used in the dishes is biodynamically grown, local produce. A copy of the restaurant's current menu is found here. What I love most about this restaurant is how the food is an art form of local California produce, all grown in its natural environment with a commitment to sustainable agriculture. Inspired by this restaurant, one of the projects I hope to explore with my own cooking is how to work with vegetables and fruit in ways I never imagined were possible - without any need for meat. It has and will be an inspiration for my cooking, and is one of the best meals I have ever had. The restaurant chef is in his early 30's (a new top chef) and has earned a Michelin star for his work. The food at Auberge du Soleil was also very good - wonderful lamb and mushroom risotto, the night we went. The view of the Valley at Auberge at sunset from the outdoor table I had reserved two months prior to our dinner was breathtaking. 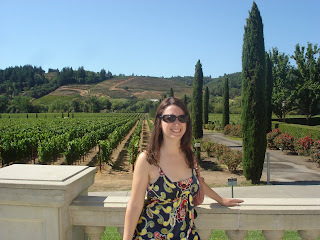 We visited a number of wineries in both Napa and Sonoma. In this article, I will discuss a number that we visited in addition to a couple that we did not visit, but would love to on a future trip: Cakebread Cellars, Frog's Leap Winery, Honig Vineyard, Goosecross Cellars, Elizabeth Spencer Winery, Terra Valentine Winery, J Vineyards, St. Francis Winery, Ferrari Carrano Winery, Chateau Montalena, Copain Winery, Kuleto Estate, Round Pond Estate and Sterling Vineyards. Cakebread Cellars has long been famous for its Chardonnay, which is known to be among the best, if not the best, in Napa Valley. Cakebread is a boutique, family owned winery in Napa Valley. Personally, I loved the Reserve Chardonnay that we tasted in the tasting room, but we also purchased their Rubaiyat (a blend of Syrah and Pinot Noir named after a famous poet who wrote about wine in one of his poems), as well as their Syrah. I know I have not written much, but the Reserve Chardonnay is definitely the best I have ever tasted, hands down. Frog's Leap Winery was probably my favorite of all the wineries we visited. Don't let the cute frog on their website fool you, the folks at Frog's Leap know how to make some amazing wines. The Winery is located in Rutherford, CA in Napa Valley and has 130 acres of organically grown grapes, used in preparing all of their wines. The winery is 100% committed to the use of sustainable agriculture in producing their wines, as well as all of the produce on the winery. The winery is also 100% solar powered, LEED certified, and uses various organic techniques to produce all of its grapes. During our tour of the winery, which was like touring an organic farm at the same time, we were given cute straw hats to wear on the tour (for the specific purpose of blocking the sun on a 90 degree day). We tasted, in addition to fresh grapes that were being used in "the crush" that was taking place at the time, freshly picked mission figs, strawberries, tomatoes and peppers. 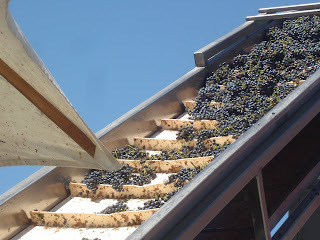 We also learned about the process of making wine on this tour and several other of the winery tours. All of their wines are amazing, but my favorites are the Sauvignon Blanc, Chardonnay, Merlot and an amazing dessert wine called Frogenbeerenauslese (try saying that six times fast), which is a late-harvest Riesling, more typical of Western New York. I am generally not a fan of desert wines, but this wine is the exception to the rule in my book. It is great with a homebaked blueberry pie. This reminds me that it is definitely time to order more! Honig Vineyards, also located in Rutherford, is also 100% committed to producing amazing wines using sustainable agricultural techniques. 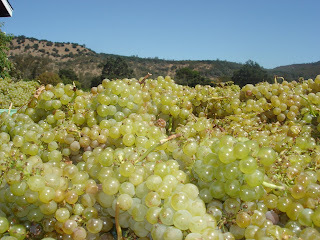 Honig produces exclusively several varieties of Sauvignon Blanc and Cabernet Sauvignon. The Sauvignon Blanc is one of my favorite Sauvignon Blancs, while the late Harvest Sauvignon Blanc (another dessert wine) is also wonderful. We tasted the wines at a picnic table outside in the middle of the winery's breathtaking natural beauty. This winery, like some of the others I have or will mention, is a small, family-owned boutique winery, which was the type of winery we focused our trip on. 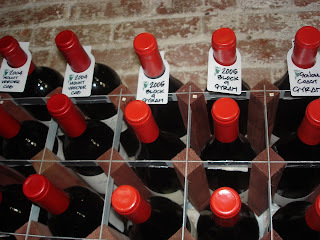 We skipped all the large, better known commercial wineries in the region. Goosecross Cellars is another family owned, tiny botique winery committed to the use of sustainable farming in producing the grapes used in their wines. The wines are terrific, and you feel totally at home in the beautiful, close-knit winery. Chateau Montelena, in St. Helena, which we unfortunately did not get a chance to visit, is one of two wineries that put Napa Valley on the map during the famous 1976 Paris Wine tasting (the other being Stag's Leap). This is chronicled in the movie Bottleshock. The movie reminded me of all the things I love about Napa and Sonoma, and true to their reputation, their Chardonnay is out of this world. We will have to check out the winery itself on our next trip. Elizabeth Spencer Winery is a small winery owned by a couple, Elizabeth and Spencer. We hadn't originally planned to visit this winery, but we wound up making a stop there at the suggestion of our driver for the day from Beau Wine Tours, and were glad we did. The tasting room was nice and unpretentious and the wines were great. We did several days of wine tasting, and one day we went to five wineries using a professional driver so that my husband could enjoy drinking the wines without having to spit at the tastings. This was a great decision that will make your wine tasting trip more enjoyable. J Vineyards in Sonoma County (Healdsburg) has a bit more of a party atmosphere, but is a fun place to visit. Healdsburg is in Sonoma County and is a bit of haven for foodies in Sonoma (it is also the site of Cyrus Restaurant and Dry Creek Kitchen). We were in Healdsburg during our trip for a wedding of friends of ours, John and Alison (at nearby Trentadue Vineyards), which was the reason we organized the entire trip in the first place. J Vinyards is known best for their sparkling wines -we took home the J Brut. Their food and wine pairings have also been quite popular. Kuleto Estate and Terra Valentine Winery are both located on top of mountains, thousands of feet above the rest of Napa Valley. Kuleto Estate, which we visited is owned by Pat Kuleto, who owns the acclaimed restaurant Boulevard in San Francisco (in a word, amazing - we dined here earlier in the week with our gracious San Francisco hosts Peter and Jill), as well as a number of other high-end California Restaurants. We actually saw Pat Kuleto driving a four-wheeler (or some other type of ATV) around his beautiful winery during our tour. The winery is located on top of a mountain on top of St. Helena. It is a bit tricky to get to, involving long and windy roads up and down the mountain and punching in a gate code at some point. We learned of this winery from reading an article in Conde Nast Travel. However, the natural scenery of the winery and the view were simply breathtaking. We enjoyed the wine and food pairing very much, especially the Zinfandel. However, it was good that we made the visit to the winery our last of the day, given that we both felt a little carsick after driving down the winding road down the mountain after the tour. Sterling Vineyard, in St Helena is known for the fact that you have to take an aerial gondola to get to the winery, where you can taste the Sterling wines. I was a little nervous about this, being afraid of heights, but enjoyed the ride nonetheless. This winery may be a tad more commercial (I have recently seen a few billboard ads in New York) but the gondola ride to the tasting room is a great way to take in the views of Napa Valley. The wines are terrific too - I enjoyed the Chardonnay the most. Ferrari Carano Winery is a pretty popular Sonoma County (Healdsburg) winery to visit because of its breathtaking landscaping and gardens. The white wines here are also pretty good - especially the Pino Grigio and the Chardonnay. We also discovered that their wines were among the local wines served at our friends' wedding later that evening. Finally, Round Pond Estate operates both a winery and an olive mill. We visited the olive estate on our last day in Napa and learned how olive oil is made. During our tour we were treated to a wonderful buffet lunch of their products and various delicious local California foods. Who knew that olive oil tastes absolutely amazing on vanilla ice cream? My favorite of their olive oil are their Blood Orange and Meyer Lemon olive oils. The estate here is also gorgeous and was another good tip from Conde Nast Travel. We also visited several other wineries that I have not written about here, but were also quite good - Plumpjack Winery (a trendy winery owned by San Francisco mayor Gavin Newsom) and Copain Winery (where we had a nice private tour). 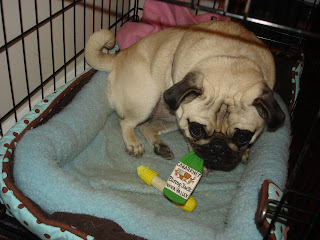 At Plumpjack Winery, we enjoyed their store where we purchased Cabarknet cookies for our dog (hence the picture of my pug at the top), and enjoyed paging through the pages of the book "Winery Dogs." Finally - one new winery that we did not visit - Quixote Winery - is an architectural paradise. I had wanted to visit this winery (which I am told has excellent Petite Syrah and uses the Napa-famous screw top method of bottling wine). This winery is designed by the architect Friedensreich Hundertwasser and basically looks like Dr. Seuss designed a winery. Unfortunately we will have to save the tour of this amazing place for our next trip. The trip was a culinary and gatronomical adventure where we truly ate and drank our way through Napa and Somoma, before heading inland to Yosemite National Park. I knew Dakota would eventually make an appearance in the Blog! Thanks so much for the mention! Come out and visit us anytime!